This 'Multi-Pitch Trad Climbing' article is part of the e-book - Trad Climbing Basics. 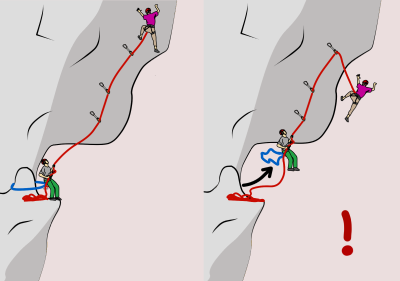 A multi-pitch route is one that is split into two or more pitches. This may be because it is longer than your rope. Or it could be a wandering route that would involve a lot of rope drag if climbed as a single pitch. 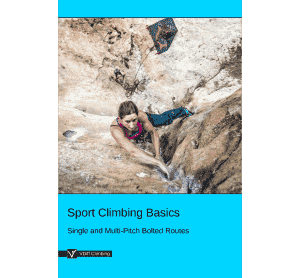 Multi-pitch climbing combines many skills: placing gear on lead, building belays, route-finding, rope management and (often) abseiling down after you reach the top. 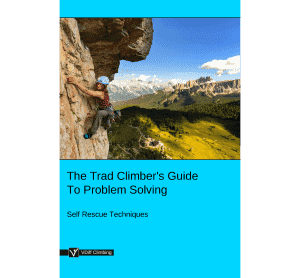 Due to the length and complexity of multi-pitch routes, you should develop your problem solving and self-rescue skills before embarking on this kind of adventure. If your multi-pitch is likely to take more than a few hours, consider bringing food and water to snack on at the belays. Many routes have luxury belay ledges, so if you're not in a rush, why not have a vertical picnic? A small first aid kit can be useful, along with a pocket knife for cutting anchor webbing or stuck ropes. Make sure the knife has a folding blade which is impossible to accidentally open when attached to your harness. On a single pitch, it's easy to remember where to climb. However, on a multi-pitch you may have forgotten the details by pitch six. Another option is to take photos of the topo on your phone. Make sure you don’t run out of battery though. Take descriptions from adjoining routes too, as this can help you figure out where you are. If you take spare batteries, tape them together in the correct orientation, so you can just plug the whole block in at once. This also means you won’t have random batteries floating around your bag and no idea if they are full or empty. Alternatively, the load can be split between climbers so neither climber has a particularly heavy bag. Depending on the route and your tolerance of suffering, you may not need any of it. For routes that are difficult to return to the base, you'll need to bring everything. Plan before you go. The VDiff team once got stuck 200 meters up a multi-pitch in the dark with no food, water, jackets or headlamps. It was a long, cold night. 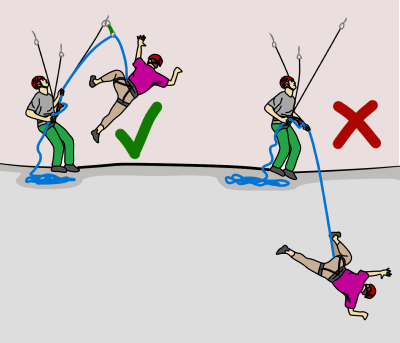 If the leader falls on a single pitch route, the belayer is often pulled up off the ground when they hold the fall. 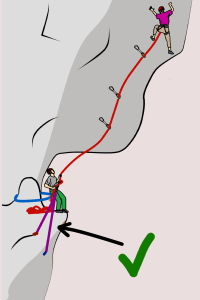 On a multi-pitch, the belayer would instead be pulled out of position. This could potentially pull out part, or all, of the anchor if it was built to only hold a downwards force. For this reason, you should build multi-pitch anchors with both an upwards and a downwards pulling aspect. If the last pitch traverses into the belay or the next pitch traverses away from it, the anchors could get loaded with a sideways pull. Build the anchor to be strong in any conceivable direction of pull. If the best upward-pulling gear is just below the downward-pulling anchor pieces, you can incorporate it into the anchor with some cordelette craft to make it multi-directional. There are many variations to this. One is to tie clovehitches on the lower two pieces as shown. Sometimes the more experienced climber will lead every pitch. Other times, each climber will choose which pitches they prefer. A common tactic is to swing leads (lead alternate pitches). Be aware that easier pitches may be runout. 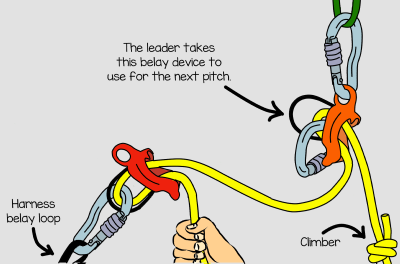 If alternating leads, the easiest method is to tie-off your belay device. When the leader is ready to climb, simply unfasten the knot and they will be on belay immediately. This works well if there is a small ledge to stand on. If not, you may prefer to choose method two. If the same person is leading every pitch, the second will have to attach to the central point, in the same way as the leader. The leader will need to be put on belay before they detach from the anchor. 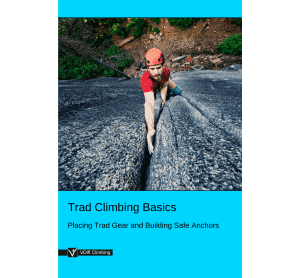 If belaying with Guide Mode and swapping leads, you'll need to change from Guide Mode to normal belaying when the second has reached the anchor. 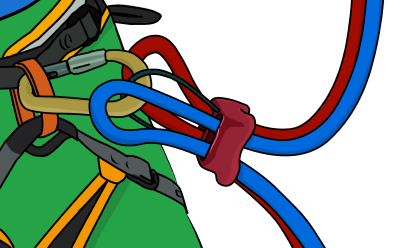 To do this, put the second on belay as normal with another belay device, then remove the Guide Mode setup. 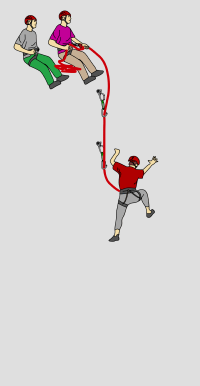 It's better if the next leader removes the Guide Mode setup so the belayer can keep both hands for belaying. 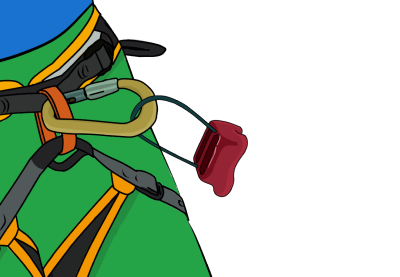 It's a good idea for the leader to clip a high point of the belay as their first piece of gear. This eliminates the chance of a factor two fall should they fall before finding protection on the next pitch. 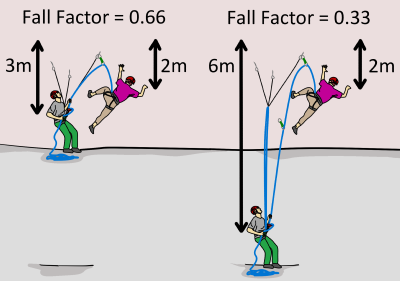 You can reduce the fall factor further by extending the belayer's anchor attachment. This puts less force on the first pieces of gear if the climber falls. Recommended belay stations will be described in the guidebook. You don’t have to belay there, but they are usually the best spots. 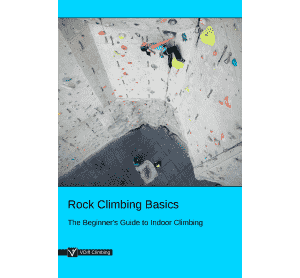 Experienced climbers often stretch pitches to the full rope length to reduce the number of belay changeovers and therefore speed the climb up. Teams with an inexperienced partner may do shorter pitches so they can communicate more clearly. 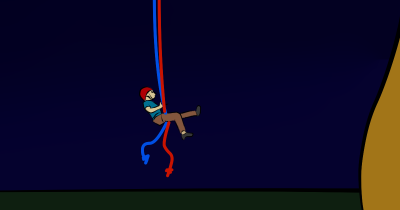 If there is no belay ledge, you will have to create a hanging belay. Try to create this in a place which at least has some good footholds. It can be unnerving at your first few hanging belays, because you must completely trust your anchor and lean all your weight on it. The key points are making sure the anchor is bomber and having the central point at chest level or higher so you can lean out comfortably. For long belays, keep moving your feet around to stop your legs from going numb, or stand in a sling to get the weight on your feet if there are no footholds. 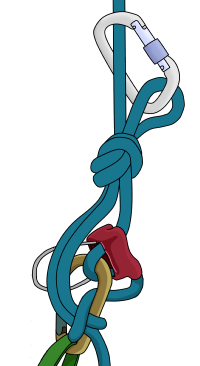 Stacking or coiling the rope neatly so it doesn’t tangle is important on multi-pitches. If the belay ledge has a flat area, simply stack the rope onto it in a place where it won’t slide off. 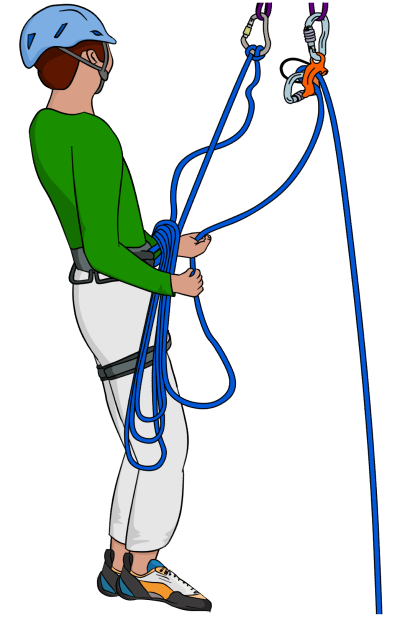 If there isn’t a suitable belay stance to put the rope, you can stack it in neat coils across the rope which goes between your harness and the anchor (lap coils). If climbing with half ropes, treat them as one rope and stack them together in the same way. Break the climb down into pitches and figure out how long each one will take. Remember to add time for approaching and descending the route and for belay changeovers. Be conservative with your estimations – it’s much easier to lose time than gain it. As part of your time budget, it’s smart to figure out places where you can switch to an easier route if you are running low on time, or places where you could easily descend without leaving most of your rack behind. It also means you have an extra person to help carry the gear and lead some of the harder pitches. 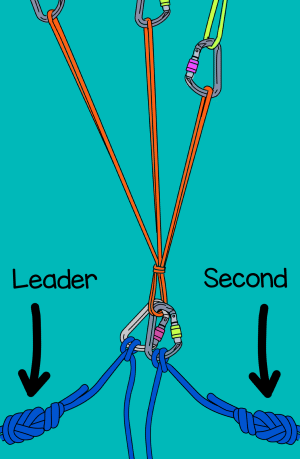 There are many ways to connect three climbers to the rope. Two popular methods are described here. 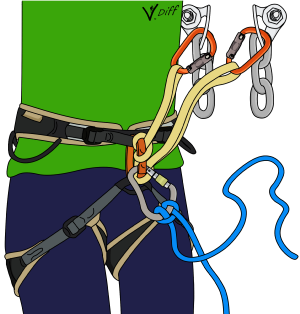 The second climber unclips the gear from the first rope and clips it to the second rope beneath them. This ensures the third climber is protected from a swinging fall if the pitch traverses. 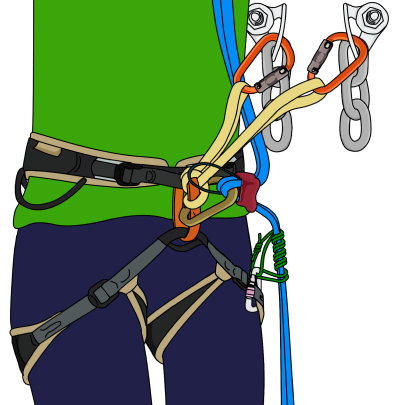 If the pitch is straight up, the second climber could remove the gear. 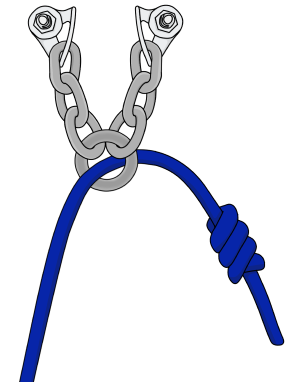 This technique is often employed with half ropes. However, half ropes are not designed to be used individually when following a pitch. For this reason, it is recommended to use two single rated ropes instead. The leader climbs with both ropes. They clip gear alternately to each rope. 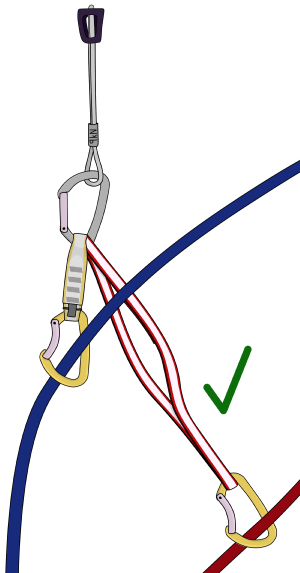 When communicating, finish the command with the rope colour, so the belayer knows which rope you mean (e.g: slack on red rope). It also reduces the ropes impact absorbing capabilities, and therefore puts a lot more force on the gear. This makes the gear less likely to hold the fall. 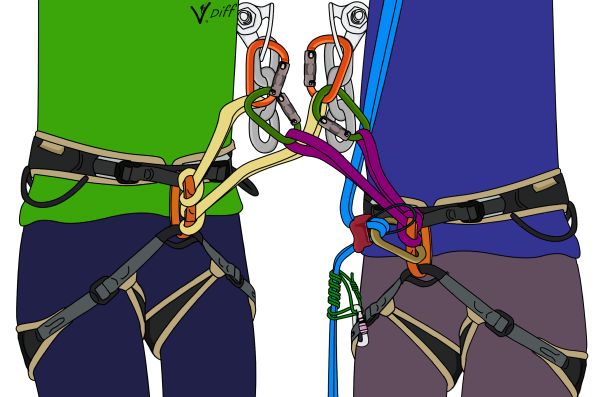 If you need to clip both ropes to a piece of gear (e.g: to protect both followers on a traverse), use two quickdraws of different lengths as shown. After abseiling, attach to the next anchor as described here. For bolted anchors, make sure to attach to both bolts independently. If there is only space for one climber to attach, the other climber can clip directly into their partner’s screwgates as shown. 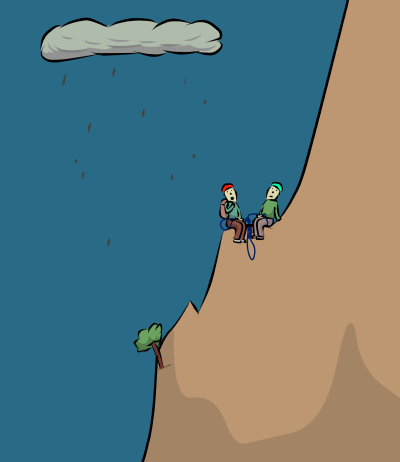 However, this means that the climber who descended last must descend first on the next abseil.